Preliminary McIntosh Harvest Date Forecasts -- Date to apply ReTain to delay first harvest of apples which without treatment would be ready for storage harvest on September 8 is from Monday, August 11 to August 18. Date to apply ReTain to delay maturity for 2nd, 3rd, or 4th pick o those apples without delaying start of harvest maturity, is from Monday, August 25 to September 1. Begin measuring actual McIntosh starch-iodine no later than Friday, August 29. The Michigan formula estimates that non-spur McIntosh will reach starch index 4.0 and start the optimum harvest window for long-term storage on Wednesday, September 10. Using the Hudson Valley, NY formula, McIntosh maturity is forecast to reach starch index 6.0 in Belchertown, MA on Friday, September 26. 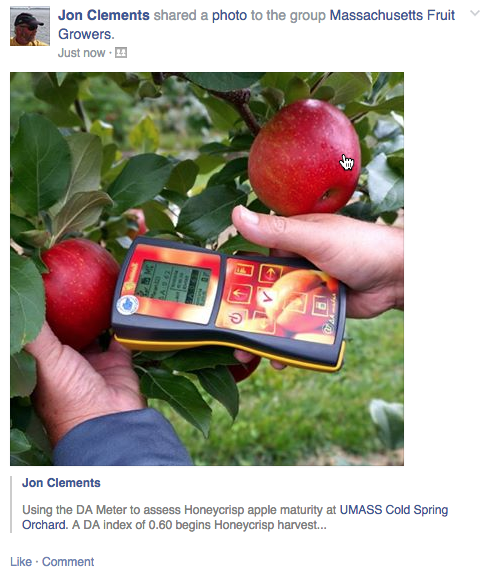 Note: updated apple maturity report always available on UMass Fruit Advisor. All apples tested from UMass Orchard, Belchertown, MA unless otherwise noted. Following are "target" harvest indices for some of the more popular commercial apple varieties. Always use your best judgment when deciding when to harvest, but most fruit should fall within these indices for proper harvest maturity and best fruit quality. You may be unfamiliar with the DA index. It comes from a DA Meter (Turoni, http://www.trturoni.com/en/content/8-da-meter). It measures the amount of chlorophyll left near the fruit surface. Apples (and peaches) lose chlorophyll and green color as the fruit ripens. The DA Meter puts a value on this loss of chlorophyll, and some standards have been developed on when to start and end harvest based on the DA index. For example, Honeyscrisp is suggested to start harvest when the DA index is 0.60 and end harvest when it reaches 0.40. Thanks to Mass. Fruit Growers' Assoc. Horticultural Research Fund/Foundation for purchasing the DA Meter ($4,000). The next (and last for 2014) Healthy Fruit (and apple maturity report) will be published on Tuesday, September 23, or thereabouts, 2014. (In two weeks.) As always feel free to get in touch with any member of the UMass Fruit Team (http://extension.umass.edu/fruitadvisor/team-members) if you have questions or comments.